Last evening, I was fortunate enough to meet up with a couple of local Milwaukee food bloggers, Phi (aka: www.sweetphi.com) and Shanon (aka: www.thecurvycarrot.com) at Braise restaurant in Walker’s Point (a Milwaukee neighborhood). Phi has been in Milwaukee for a few years now, but was really looking to connect with other area food bloggers. 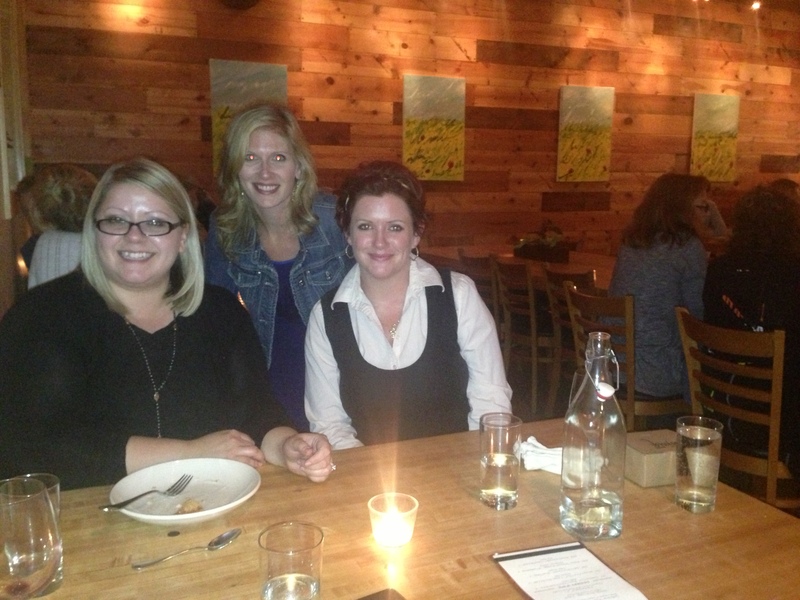 I’m so glad she scheduled a meetup, and especially glad that she chose Braise – a place I had yet to visit (FTR – there’s a long list of places I’ve yet to visit, and that list grew tonight as I continued to converse with these women!). I’m also very happy to report that I had a much better meal than I had during my last outing in Milwaukee. Shanon is also fairly new to Milwaukee (~a year here), so we have a lot in common, and shared interview, house-hunting, dating and downtown living stories. Lots in common! And, although Phi is happily married for just about a year, she joined right in and took the cake with a truly disastrous dating story (folks, you can’t make this stuff up! ), as well as a hopeful and inspiring recollection of meeting her husband here. She’s also covered an insane amount of ground in Milwaukee…she knows this city inside and out! A great resource, but an even better personality! She, her husband, and her sister-in-law try a new restaurant every month – what a great way to explore the city’s culinary offerings! When our server, Erica, came back to take our drink order, as my dinner companions expected, I asked Erica to choose my meal and a glass of wine with which to pair it. Erica was completely on board. She took my card and gave an enthusiastic “okay!”. 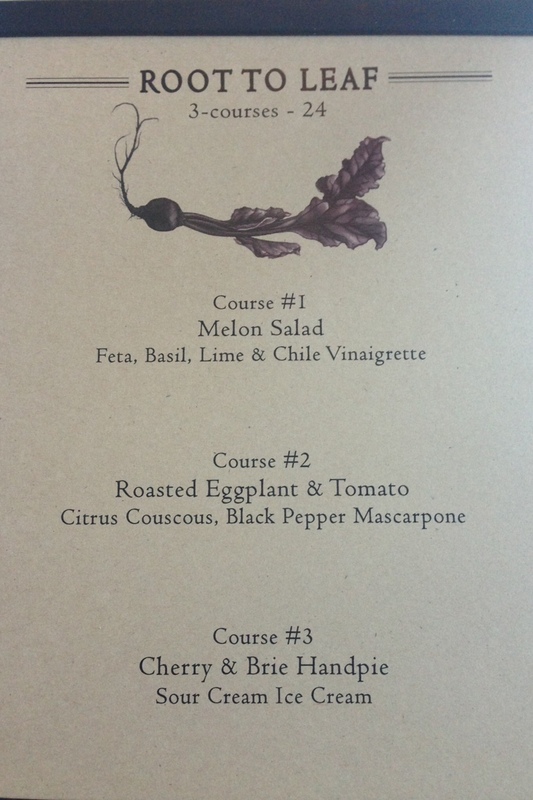 Here’s a peek at the menu – full of unusual and intriguing flavor combinations. 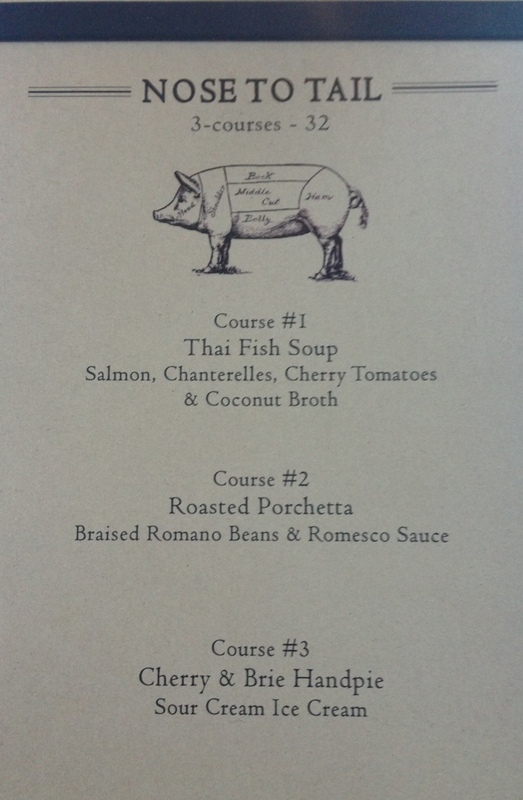 Phi ordered the “Nose to Tail” three-course meal, and Shanon ordered the “Root to Leaf” three-course vegetarian meal. Both admitted that the dessert was the big seller tonight. I can’t say that I blame them…it sounded divine! I was also served three courses, but I didn’t know that until I decided that I couldn’t resist the dessert Erica was to choose for me much later in the evening. In the meantime, as she delivered me a glass of wine, Erica asked me if I like Rosé. And, frankly, if she had asked me that before my date with “the wine guy” (who will remain a friend of mine here, but I’ll keep his actual identity quiet for now), I may have been disappointed with her choice. However, “the wine guy” brought a very nice bottle of Rosé to our first date, and I found it really refreshing and unexpectedly elegant. The particular glass she served me was the 2012 Rose, Coteaux d’Aix en Provence (Domaine de la Grande Seouve). There are several Rosés on the menu, and two by the glass at Braise! As Shanon and Phi were served their respective first courses, I was served mine. 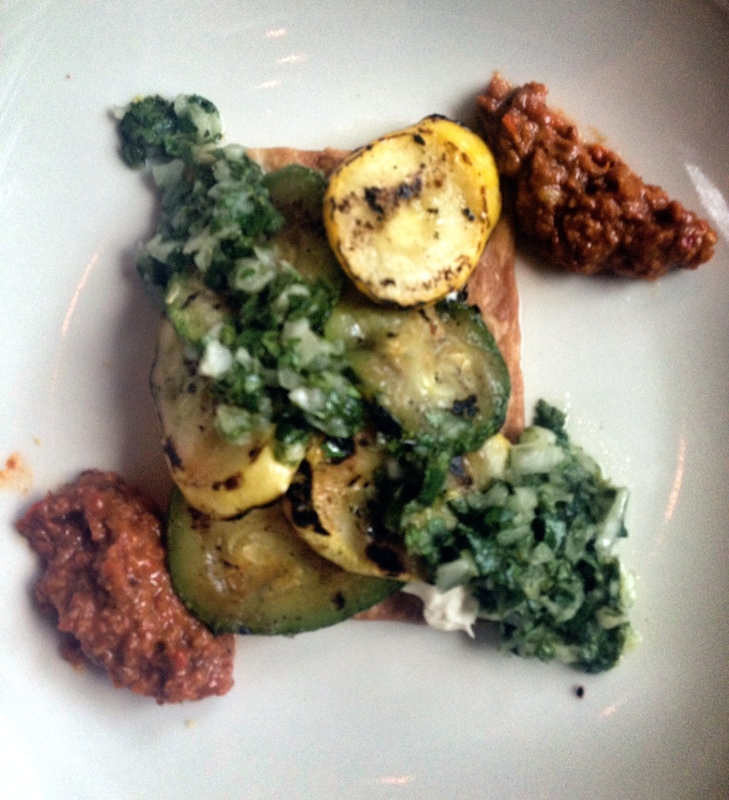 I was served this delicious appetizer of grilled summer squash tart, black pepper Mascarpone & Romesco. The flavors were all strong, yet none was overpowering. The charred grill flavor of the squash along with the creamy Mascarpone and the nutty Romesco flavors worked beautifully together! On top of everything, this was a perfectly portioned size – not too large, but enough bites to really enjoy the flavors. 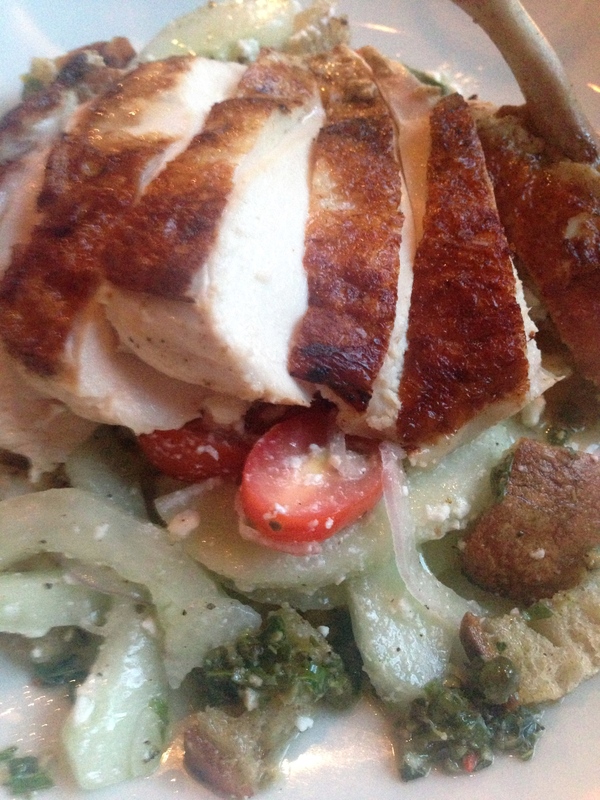 Following the appetizer, a plate of roasted chicken breast was placed in front of me. Friends, I’ve been served roasted chicken several times in recent months (must be an “it” meal), but before even touching my cutlery to the meat, I could tell this was special. Look at how moist the chicken breast is! The chicken breast was insanely tasty, and expertly prepared. 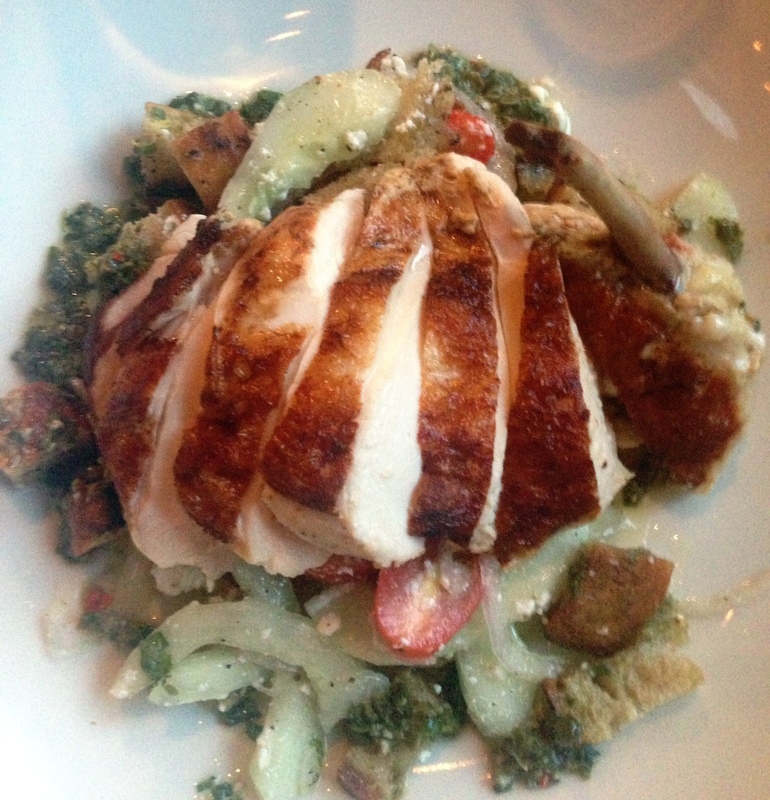 And, the flavors beneath the chicken were incredible! Light and “summery” thanks to the cucumbers and feta. Yet, there was a bit of a hearty bite to the plate with the Panzanella salad (another recent favorite of restaurants I’ve been to lately). I was only able to finish about half of this dish, but I’m confident that the leftovers I brought home with me will be very good tomorrow night. Mind you, both Shanon and Phi were really enjoying their meals as well. Plates were pretty clean all the way around. When Erica came back around to deliver my leftovers, she asked if she should choose a dessert for me too, since my companions were having desserts as part of their meals. I love that she was so confident in Braise’s offerings, and so “on board” with “She Ordered What?”! As I mentioned, I didn’t know I’d be having a three course meal…I had to take half of my entrée home with me, for crying out loud! So, I politely declined Erica’s offer. Then… I asked her what she would have chosen if I had taken her up on her offer. 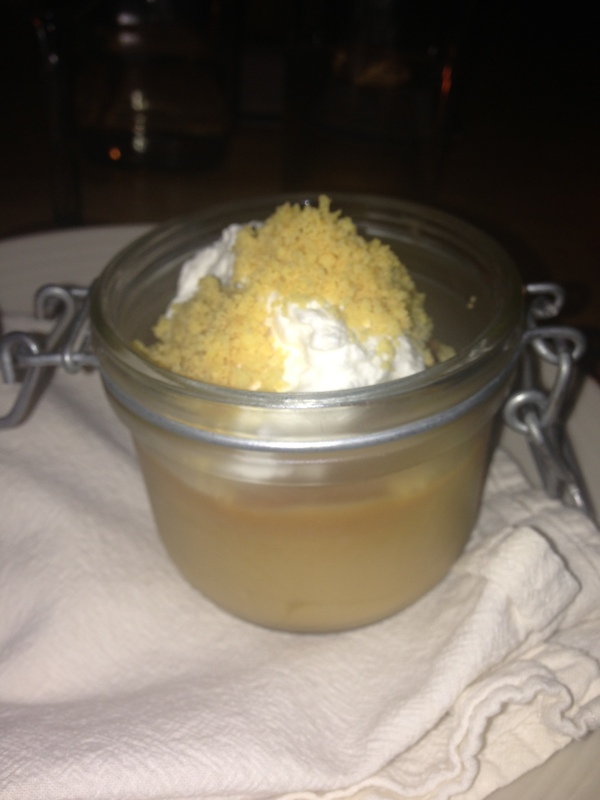 She told me she would have chosen the “Pork Fat Budino” (basically, a caramel pudding-type of dessert with whipped cream and salted shortbread crumble (and, Erica and/or Braise staff, please correct me if I’ve butchered this!)). I was so intrigued that I decided to give it a try. DELICIOUS!!!! I’m not one of those “crazy for salted caramel” people. And, I’m not always a dessert person. Yet, aside from the bite I offered up to Phi (who tried it) and Shanon (who denied it), I finished the whole danged thing! Phi mentioned tasting a bit of a gingerbread flavor to it, and I think the salted shortbread probably contributed to that. Regardless, this was light in texture, but rather heavy in flavor (in a good way! ), in my opinion. In short, it was unusual and quite decadent (but not in an overwhelming way). It was also a nice sized portion, like the appetizer – enough to enjoy, but not so large as to overwhelm. I’m really glad to have gone out to Braise on an evening when we could enjoy our leisurely dinner (Tuesdays nights are not likely their busiest evenings), and to have enjoyed this evening with two extraordinary women. I thank both Phi and Shanon for spending time getting to know me, and for allowing me to get to know them. I’m looking forward to exploring more of the GREATer Milwaukee area with these women, and other local bloggers. Braise also offers a home-delivery produce/meat service. It’s similar to a community supported agriculture service, but allows you to only pay for what you buy (plus an annual fee), rather than a set fee and an order which may be more, or less, than you need on any given week. The restaurant also offers cooking classes. I’m fairly certain I will give one of these a try in the future! What’s your favorite spot in the greater Milwaukee area? What’s your favorite farm-to-table, restaurant-supported-agriculture, or other locally supplied restaurant – anywhere? Love it! And I have to say I declined the dessert only because of the whole vegetarian-ish thing, but it looked delicious. And I love that you love Malbec, too-it’s my favorite! Looking forward to meeting up again! Thank you, both! Your support is so appreciated. And, yes, I’m looking forward to many more MKE adventures! It was wonderful to have met you too! We’ll have to find a time to enjoy a nice Malbec together. This summer “fall” weather makes the idea all the more attractive, IMO. Love it! And I have to say that I declined the dessert because of the whole vegetarian-ish thing, but it looked delicious! And I am glad you like Malbec, too-it’s my favorite. I can’t wait until the next one, ladies! Kerri, down in the Lowcountry (Charleston area) Braise would be described as a Slow food restaurant (Local farm to table). Those are always the best!